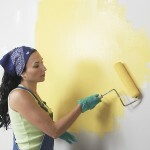 Acrylic wall paints for interior are environmental friendly products based on acrylic dispersions. They can be thinned down with water for spray application. The dry film allows steam penetration, –the coated surface can “breath”. The painted wall may be washed/cleaned with pure water without removing the paint. Produced with high quality acrylic resins, these paints are easy to apply and show excellent properties. Specific products: Amorsa 30 Primer, Mester FV 820 Acrylic wall paint, Ambient FV 830 Acrylic wall paint.